The Tellus Engine supports fully skinned, biped human characters using motion capture (MOCAP) based animation. Character movements are derived from captured human motion to provide a highly realistic visual representation of animated character performing common movements. Tellus uses embedded scripting throughout the environment for artificial intelligence (AI, vehicles, weapons, sensors, or any object that needs to be aware of the environment or communicate with other objects. Utilities are provided within the AI System including path finding, logic operations and decision management. A central feature of the AI system is a programmable inference engine designed to optimize the processing of thinkers and sensors used to drive the logic and decision management and connect scripting functions. The Tellus Engine support several flavors of scripting including C#, IronPython, and Visual Basic. 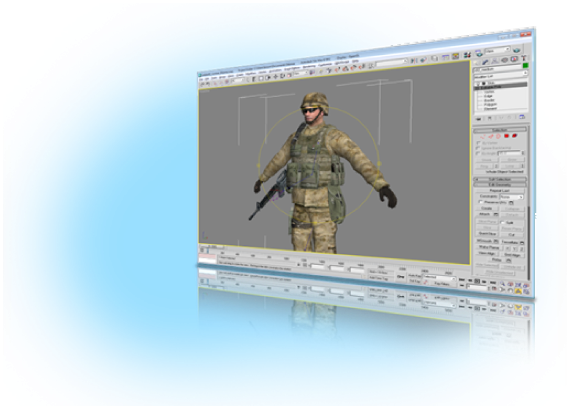 Scripts can be embedded in vehicles or character models at any level or run at the application level for controlling almost any aspect of the simulation system.